AS IT STANDS: Trumpism vs The Environment: Which is More Important To Americans? Trumpism vs The Environment: Which is More Important To Americans? Trump's primary goal is to destroy everything President Obama did for this country. That includes the protections instituted for the environment we live in. 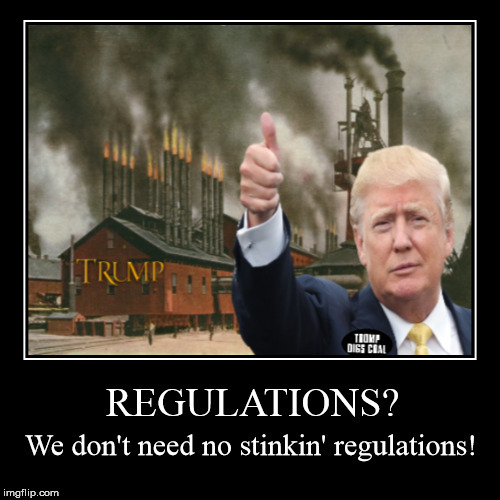 Trump put his sock puppet,Scott Pruitt, in charge of the Environmental Protection Agency (EPA) with instructions to reverse clean air and water regulations - a move akin to putting a fox in charge of the hen-house. The limitations of Trump’s power to reset U.S. climate policy has been on full display over the last few days in Washington. White House plans to scrap restrictions on the release of a potent greenhouse gas are getting stymied by the courts, by forceful public opposition and even by Republicans in Congress. The resistance is real. Americans aren't going to idly stand by as Trump and his minions try to destroy our environment.